I recently traded in my longstanding skincare routine for something au natural and let me tell you my skin has never been better! I didn’t have particularly troubled skin in the first place but I had a lot of under the skin spots, the odd breakout and it was just a bit dull. 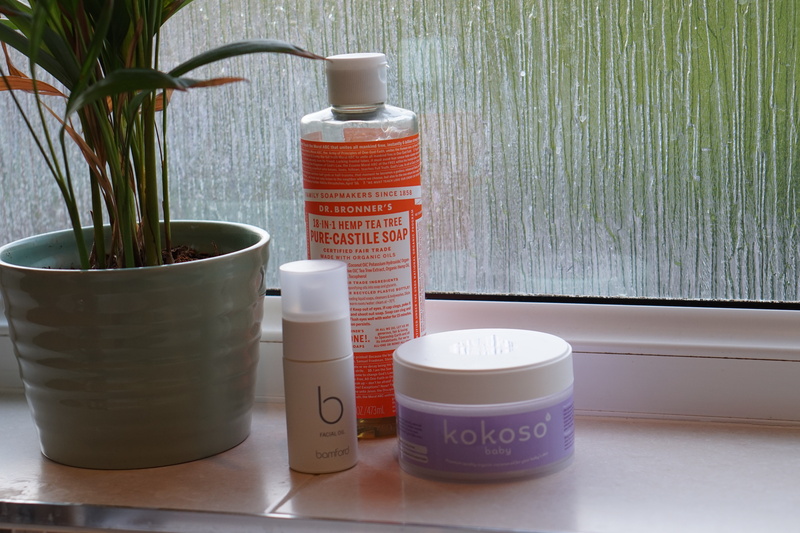 I’d been using Liz Earle for a good couple of years and I loved it; the smell was wonderful and I always felt as though I were in a spa when I used it but but as I’m on a mission to cut out toxic chemicals I decided to look for something 100% natural. I must mention though that Liz Earl is really very natural they just include some parabens and as my skin still had some trouble areas I thought I’d give something new a go. So my new routine has three simple steps; sometimes I do skip step one as step two does the same job however it’s not quite as gentle so I do make an effort to keep in that first step. I then move onto washing my face; even though the coconut oil removes the make up really well I know that if I were to wipe over my face with a baby wipe there would still be some make up there so I then go onto washing my face to really get into the pores and get out any excess make up and/or dirt. 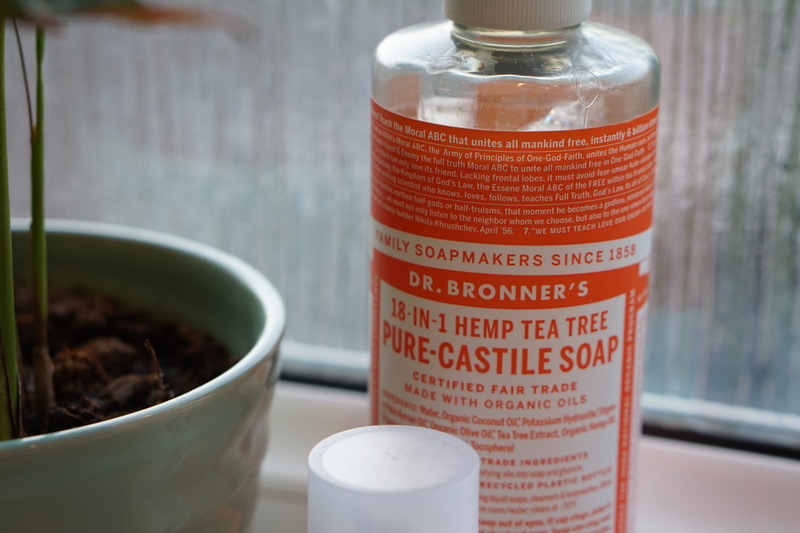 Currently I’m using Dr Bronner liquid soap and I am loving it! Dr Bronner has 18 uses so not only can I put it on my face but I could use it to wash my hair, clothes, dishes and floors. It’s completely natural and practically melts away any impurities. Now what’s fab is that this does actually remove make up incredibly well, in fact it does so way better than coconut oil, however if you get it in your eyes – oh my goodness does it sting. I could certainly miss out the make up removal step one and go straight onto this as with only one wash every single spec of make up or dirt is gone and I don’t think I’ve ever gotten results like that with another face wash; but that eye sting to me just isn’t worth it so I’d rather use something gentler on my eyes at least just so that I can avoid that area with the Dr Bronner soap. If I don’t have eye make up on, or any make up at all for that matter then I do tend to go straight to this step anyway. Using this soap leaves a real squeaky clean feeling on your face, it literally squeaks when you wipe your hands on your cheeks and that did take a bit of getting used to. It’s great because it proves just how clean your face is but then it can be a little strange if you’re used to your skin feeling more soft and moisturised after washing it. Just to point out, Dr Bronner is 100% organic and natural but it’s the essential oils are concentrated that’s why they’re not so tear-free. This is especially so as I picked up the tea tree scent to start with. I am a huge fan of oils for both my hair and skin and I do plan on sharing a post on my favourite ones and what I use them for. I have a few that I use at this stage; jojoba is great because it’s the closest oil to that which our skin naturally produces however I really don’t like the smell. It’s nutty and some brands can smell a bit meaty which is not what you want to go to bed smelling like. It does give a fantastic treatment to your skin though and I know that everyone smells things differently so it’s definitely worth trying out! 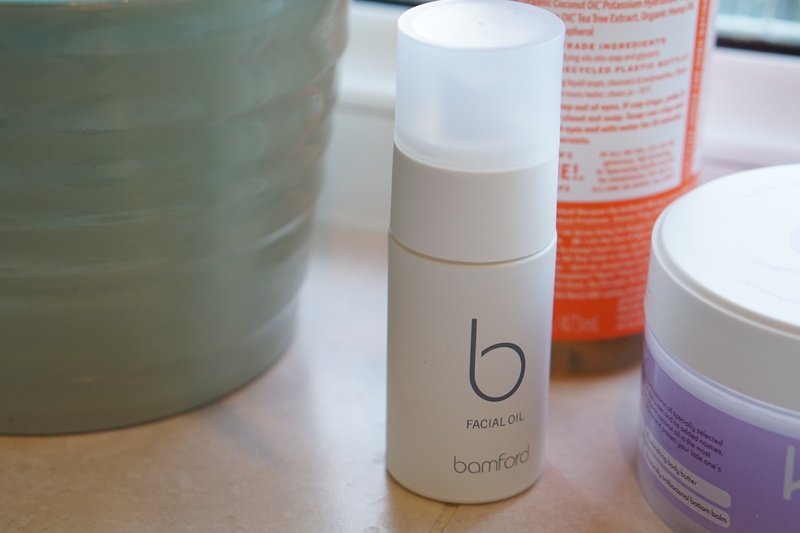 Another oil that I like to use it almond oil, coconut oil (yes step one can also be step three) and my favourite current combination – Bamford’s facial oil. It’s 100% organic, completely natural and the perfect blend of rosehip, sweet almond and evening primrose which does wonders for ageing and fine lines! It’s seriously hydrating which is perfect for me as I have dry skin and once I got over the fear of oils making my skin oily – such a myth, I’ve never gone to bed without putting some on my skin! Well that’s it – plain, simple and so effective! Since making the switch I’ve noticed my under the skin spots have literally gone; my skin is more glowing and just generally looks healthier. Of course there is still a way to go; having three young boys doesn’t do wonders for a woman’s skin but I really have seen such an improvement and would highly recommend making the switch over too. I love knowing that I’m not putting anything toxic on my face during my skincare routine and I’m all geared up now to make the switch over to all natural make up too! Any recommendations would be so appreciated so please do pop a comment below and let me know your experience!